In this book chapter, Orthopaedic Surgeons Steve A. Mora MD, Bert R. Mandelbaum MD, and J.W. Thomas Byrd MD discuss common pathology encountered in and around the hip and groin. Current understanding of pubalgia, sports hernia, and hip arthroscopy are presented in detail. Topics such as Sports Hernia, athletic pubalgia, femoral head impaction syndrome and hip arthroscopy are covered. These injuries are typically seen in kicking sports such as soccer and hockey. A thorough understanding of anatomy and patho-physiology of the hip and groin region is necessary in order to manage these challenging patients. Hip arthroscopy has allowed safe and efficient treatment of a limited number of problems within the hip joint. 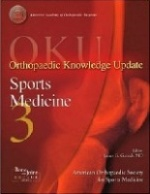 This chapter is part of a greater body of work within the textbook Orthopaedic Knowledge Update, Sports Medicine3, 2004. Developed by the American Orthopaedic Society for Sports Medicine, published by the American Academy of Orthopaedic Surgeons this clinical digest provides up-to-date extensive coverage to general sports medicine knowledge plus in-depth discussions of specific athletic disorders in every anatomical region.